What used to be Chefs’ Quarter at SM Megamall is now Uncle Cheffy. I asked one of the staff if Uncle Cheffy and Chefs’ Quarter has the same owners, and she said yes. She also said that they changed the name of the restaurant, added new dishes to their menu and retained the ones that the customers favored. I was really glad to hear these things because first and foremost, I enjoyed eating at Chefs’ Quarter before. If they offer the same delicious food, then I was sure I’d enjoy Uncle Cheffy, too. 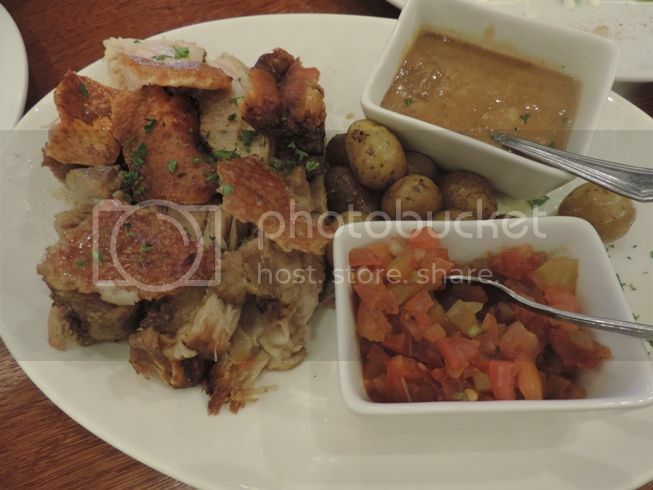 We tried their Garlic-Studded Pork Belly Lechon which cost Php95.00 per 100 grams and which was served with sautéed baby potatoes and tomato salsa. We ordered 300 grams so we could enjoy it to the full, and we did! In between bites, I gushed about how good this pork belly lechon was! The lechon skin was delightfully crispy, and the meat was tender and so garlicky delicious! They also served one of the best liver sauces I’ve ever tasted. Our 7-year-old son enjoyed this a lot, too! Super like! I always like salmon cooked whichever way, so it’s no surprise that this is what I ordered for myself. This was good, too, but because I was head over heels in love with the Garlic-Studded Pork Belly Lechon, I paid this Baked Salmon so little attention, and to think that this was more expensive than the pork belly lechon! Lol! I guess the two dishes didn’t complement each other so well. Next time, I’ll pair this with a different dish to fully enjoy its flavor. 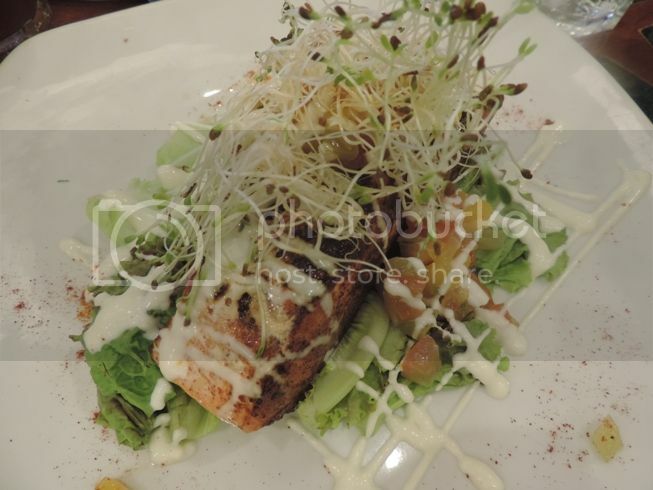 This Baked Salmon was served with fresh fruits and cilantro salsa and topped with sour cream and alfalfa sprouts. 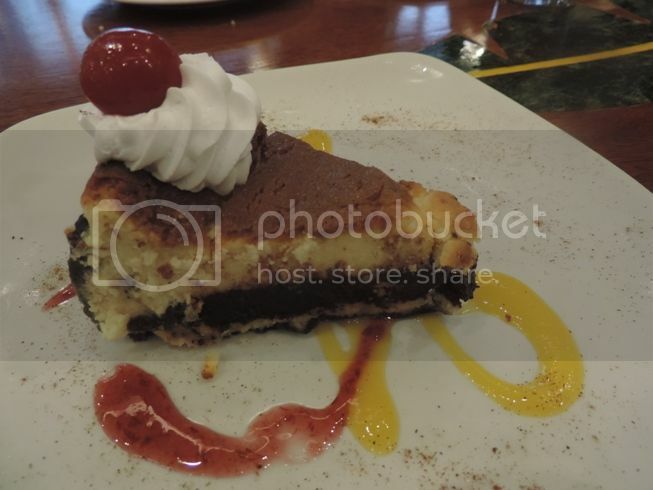 I have three words to describe this Cheffy Cheesecake: cheesy (top), chocolatey (bottom part because of the brownies), and yummy! We enjoyed our sumptuous dinner at Uncle Cheffy, and we hope to drop by again soon to try their brick-oven panizza. This entry was posted in Food Friday, Food Trip Friday, International Cuisine, SM Megamall, Uncle Cheffy. Bookmark the permalink. Our fave at Uncle Cheffy is their panizza – you should order one next time. Glad they now have a branch nearer our area. Sa Fort and Eastwood branches nila kami kumain dati. We’ve tried Uncle Cheffy only once at their branch in Molito, Alabang. We really liked it. Loved the panizza and that pork belly lechon too. 🙂 Would love to go back soon! I’ve tried the panizza at Uncle Cheffy, but never the pork belly. Now, thanks to your description, I’m super curious to try it! We have two branches here in Alabang – in Molito and Festival Mall,so for sure, I’ll be able to eat there again soon. Oh, and you really should try the panizza o your next visit. Super yum!